After trekking for an hour and a half from the Eunos MRT station, under a sweltering noontime sun and past arteries choked by the roar and smoke of motor vehicles, I was greeted by the sight of blue water and the smell of the sea at the end of the Siglap Park Connector. The sounds and smells of the road faded away, to be replaced by a sweeping sandy coast enveloped by a thick, drowsy heat under a startlingly blue sky. 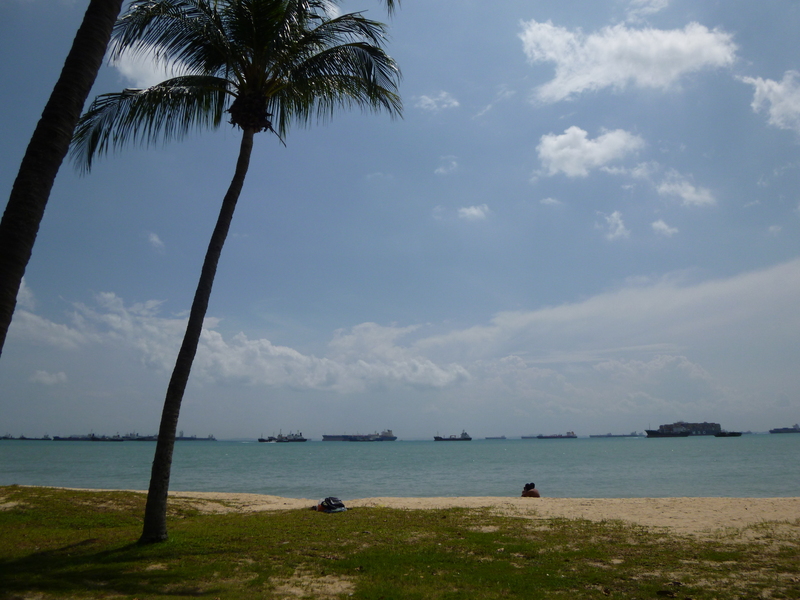 Unlike the East Coast Park I’d visited in my previous post, a languid air hovered over the park-goers present. Couples and families rolled down the cycling lanes on bikes and tricycles on the inner coast, and further towards the sea others were lying next to each other dipping their toes in the shallows, or trotting around revelling in the sand. Under the palm trees were a couple of stone benches, for those who just wanted to sit down and soak in the sun and atmosphere. I met a young man sitting by himself on one of them, looking fairly mysterious with his dark shades. After I asked to sit next to him, I was led into a conversation by his soft droning voice. Our words would hover in the air for a short silence at times, before the wind blowing from our backs whisked it out towards the ocean. “This is actually the first time in 3 years I’ve been here. I live in Ang Mo Kio, but I have something to do in Changi so I decided to just come here. I was looking for a good place to have lunch, so I ate at Burger King and just decided to come down here to relax. I don’t usually do this, but today is my off-day. I’m self-employed so I have a lot of time. I run an online business selling removable tattoos. We don’t really supply them to schools (for National Day), because I think they find suppliers with lower prices. My partners are some of my relatives. The thing about this business is that we cater to a niche market so we don’t have a lot of customers. But I don’t feel like expanding. I’m single. It can be nice at times, but eventually you have to settle down. I’m getting old, haha. Do I like children… I have a young nephew who can be very, very, very naughty, but also very, very cute. And somehow the naughtier he is, the cuter he is. Moony =) Found a link to here while I was lurking around tdf, hehe. I love this blog – it’s such a great look at small daily experiences that can make up someone’s world. One of the common ways I can get a peek at places from around the world are travel blogs…. but a lot of travel blogs just focus on scenery and foreignness without ever paying attention to the people that live there, and lack the perspective of someone who isn’t just an outsider looking in for a couple days.